April 22 is Earth Day around the world. Are we ready, as an industry, to adopt sustainable practices? 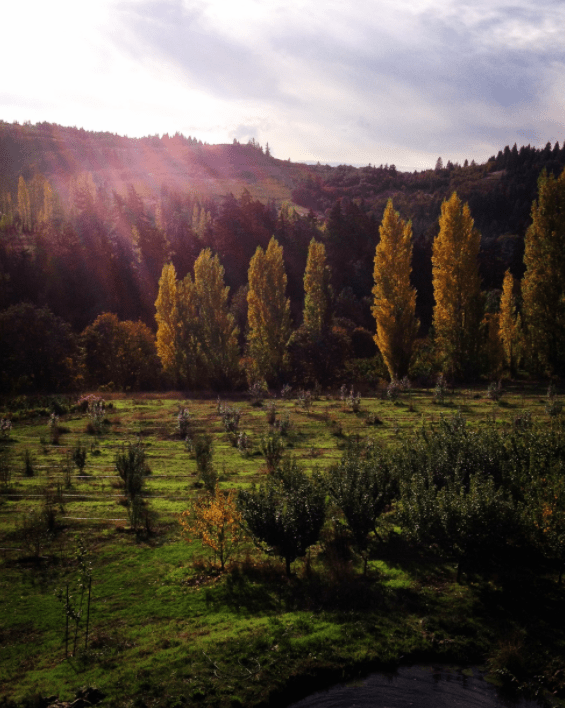 This is the first of a two-part series on environmental issues as they are directly related to cidermaking. The first article will explore aspects of apple-growing and cidermaking from a resource-use perspective, including pesticides, energy use and water use. Currently, most growers are overreliant on pesticides and fertilizers that disrupt natural ecosystems, but for centuries before modern agriculture, apple growers would maintain natural meadows under apple trees, allowing livestock to seasonally graze, and thereby to fertilize the orchard with their waste. Kristina Nance, at Rack & Cloth cider company, shared with us a modern-day example of how grazing may still be on option for fertilization. 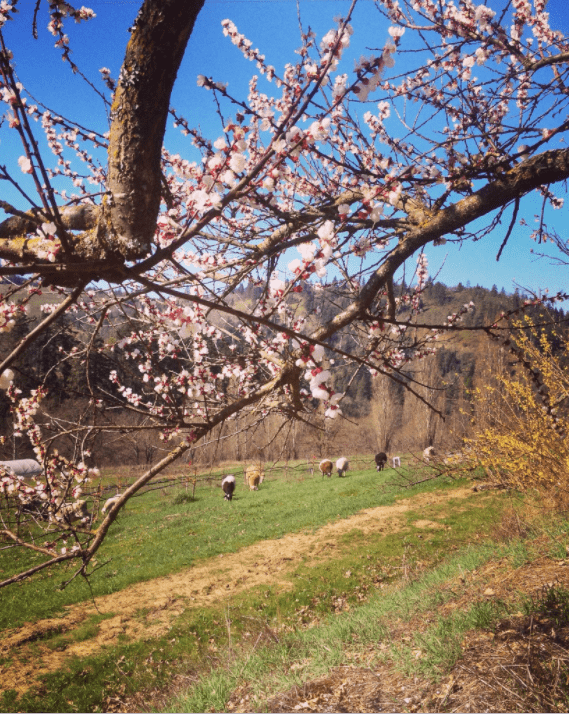 At their farm in Mosier, Oregon, they run their pigs, sheep and chickens through the orchard intermittently from the completion of harvest to early spring, allowing for the required 90-day cutoff that ensures the crop has no direct access to raw manure. Additionally, Rack & Cloth presses their apples for juice on site and feeds the wasted fruit fiber (called pomace) to their pigs. Kristina describes other uses for pomace, such as incorporating it back into the soil as compost. Because of its acidity, pomace can also be spread on the ground as a weed killer and brush reducer. Use of this or other mulches helps to prevent soil erosion, a problem that impacts both soil quality and water quality of nearby streams. If pesticides are to be used, ways to prevent damaging pesticide drift from spraying may include planting windbreaks around the orchard to control wind and planting native perennial grasses that can absorb the dust. The Deep Roots Coalition, a coalition of winemakers from the Willamette Valley in Oregon, has made a stand for sustainable agriculture. Members are emphasizing “terroir,” in the sense that the crop is selected to be suitable to its geography and soil, and thus requires minimal inputs and depends on precipitation over irrigation. Rootstocks for cider apples can also be selected for characteristics that help withstand environmental stress without extra fertilizer or unnecessary interventions. All the new Geneva Rootstocks are cold hardy and tolerant of crown and root rots. Some are resistant to certain pests and diseases to varying degrees. 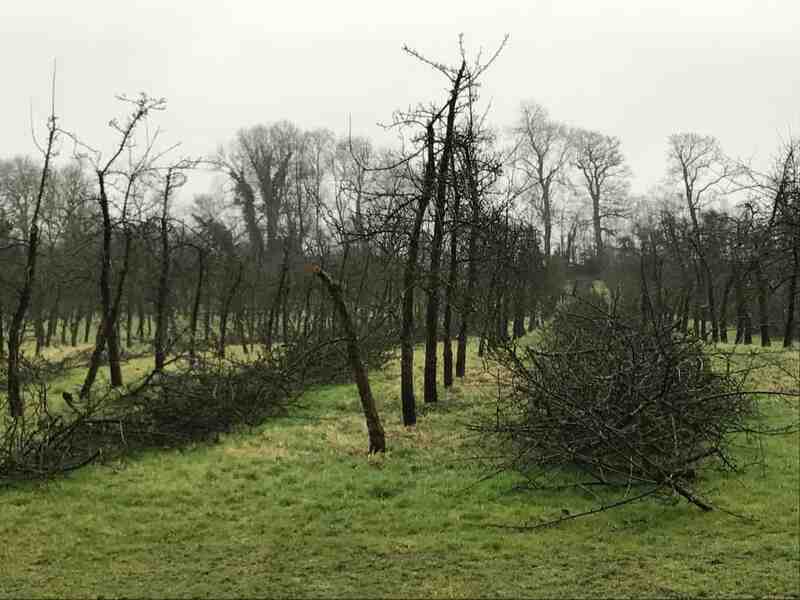 Medium density cider apple orchards planted with semi-dwarfing rootstocks—such as MM 111, MM 104, M 793, M 25, MM 103, MM 778, MM 109 and M 779—will be more vigorous than the dwarfing rootstocks. For unpasteurized juice, refrigeration is critical. Yet refrigeration involves electricity use as well as the use of chlorofluorocarbons (CFCs), which deplete the ozone layer. New equipment has been developed to address this issue, so it is usually worth replacing outdated refrigeration units. Buyers should look for refrigerants that rely on fluorines, rather than chlorines. The same consideration applies to refrigeration of all bottled cider. When it comes to heating and air-conditioning for processing and sales facilities, heat pumps are a greener alternative when compared with forced-air furnaces and conventional air conditioners. What types of fuels are used by delivery vehicles? Apple orchards are generally distant from the urban centers where cider sales are abundant and therefore extensive transportation is necessary. Electric vehicles, hybrid vehicles and diesel engines are all options to change and reduce the industry’s carbon footprint. 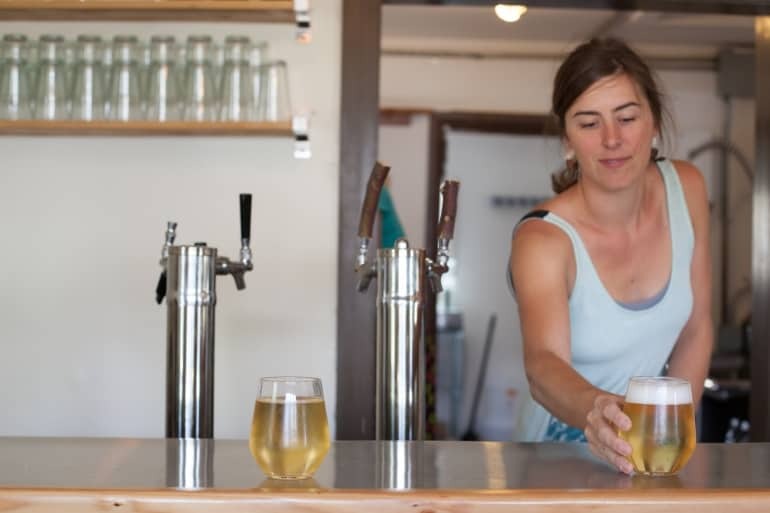 Nick Gunn, currently of BenchGraft Cider Consulting, implemented a bike-to-work program when he was with Wandering Aengus/Anthem cider companies. No doubt there are plenty of other cider companies who have experimented with green solutions. According to the Alcohol and Tobacco Tax and Trade Bureau (ATTTB), 15% of the 63.8 million gallons of cider available in the United States in 2015 was imported. Some of it was imported from Canada, but a larger percentage was imported from overseas, tapping into the even greater rate of fuel consumption used in air travel. It is unlikely that the growing supply of domestic ciders will offset the demand for European and other ciders because of the appeal of products that represent the terroir of international cidermaking regions. To use the example, once again, of Rack & Cloth, their cidery and small restaurant has a roof-mounted 10kW solar array that ties into the grid, so that with their sunny climate and southern exposure they are net positive in energy consumption (i.e., they produce more than they use). Wandering Aengus/Anthem have also relied on solar power and solar thermal systems. In Europe, French cider, calvados and pommeau maker Pierre Huet burns cut branches from pruning and captures the energy to fuel the stills. The waste energy from that process is further used to heat the tile floors. Water is used to wash tanks, counters, floors, bottles, dishwashers … the list goes on and on. Once contaminated, waste water must be treated, clarified and pumped to its new storage destination, all energy-consuming activities. In the Pacific Northwest, rainwater collection on buildings and restaurants is a worthwhile concept to investigate. Gray water collected from sinks is acceptable for use in toilets and some irrigation, but is not sanitary enough for other applications. Although some of these practices have only been adopted by extreme environmentalists, usually the investment is rewarded over time with lower utility expenses and with the added benefit of staying relevant to future generations. Selection of cleaning products is a social issue, as well as an environmental issue. Every company has the responsibility of meeting food safety standards, while protecting employee and consumer needs for minimal exposure to toxic substances. Ideally, sustainability involves a triple bottom line approach to food processing that considers economic, social and environmental needs. Watch for our Part 2 article in this series, in which we will discuss social justice, packaging and practical ways to go green for your cidery. 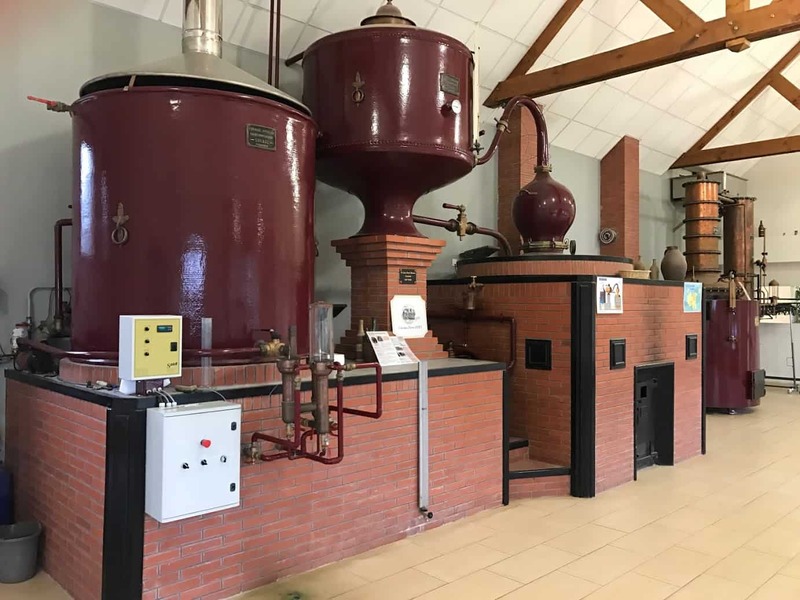 The author would like to acknowledge the input of Nick Gunn of BenchGraft Consulting, and Darlene Hayes, for sharing her observations from Pierre Huet’s cidery in Normandy.